Getting to the gym can be tiresome especially when it is far away from home. Many consider doing some exercise in the comfort of their home but investing in gym equipment can be very expensive. One way to cut down on expenses is to buy dumbbell sets. With dumbbells, there are many ways to exercise to train muscle groups. If you are looking for right dumbbells to invest in, here are the best 7 adjustable dumbbells on the market. 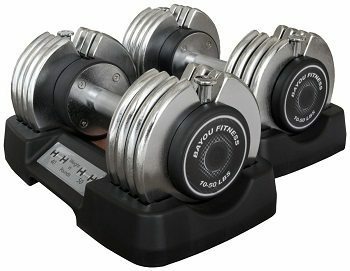 The Bayou Fitness Adjustable Dumbbells is one of the cheapest on the list. The design is very attractive, and the weight can be adjusted using the knob on each side. It is very compact and designed to save space whether at home or the gym. Weights can be adjusted from 10 pounds up to 50 pounds in 5-pound increments. Manufacturer warranty is up to one year. Some users also noted that the rack that comes with the dumbbells are too light, just be careful though in placing the dumbbells in the correct position. Another quality fitness product from Xmark, the Xmark Adjustable Weight Dumbbells that comes in two variations, you can buy as one item for 50 pounds or a pair that are 25-25 pounds. The dumbbells are made of durable steel for long-lasting use. The plates are secured by a knob with an adjustment in 5-pound increments. Grip handles are ergonomic which can be less stressful on the hands. It also comes with a plastic rack for easy storage and keeping it securely in place. Also, bear in mind that the plastic frame can easily be damaged if you accidentally drop it in. Xmark provides a 1-year warranty on its product. You may always think that Dumbbells come with circular plates, right? Well, this one is an exception. 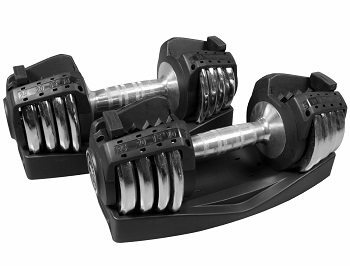 The Ironmaster Quick-Lock Dumbbells have a square design which can be more attractive to look at and can be suitable for anyone who is new to weight-lifting and experienced users. The Ironmaster Quick-Lock can support plates up to 75 pounds with adjustments in 2.5-pound increments. The dumbbells are made of high-quality materials, but the locking mechanism is a bit tricky to figure out at first. Again with the square shape design of the plates, you don’t need to place it on a rack or worry that it roll on your floor. For more assurance, Ironmaster provides a lifetime warranty on the product. Another revolutionary design, the Power Block Sport Block 2.4 Adjustable is a Pair of adjustable dumbbell weights for efficient, cost-effective strength training. It features adjustments from 3 to 24 pounds in 3-pound increments. The handles are padded for optimum wrist protection, and the design is more compact and balanced compared to traditional dumbbells. The design speaks for itself as you don’t need any cradle or stand to place your dumbbells. Wherever you put it, you can neatly store or hide it in your closet. With a maximum weight of 24 pounds per hand, this is perfect for beginners who want to start light. Power Block Sport Block 2.4 Adjustable Dumbbells are the most versatile and effective exercise tool ever developed for strength training. Power Block offers a 10-year limited warranty on this product. 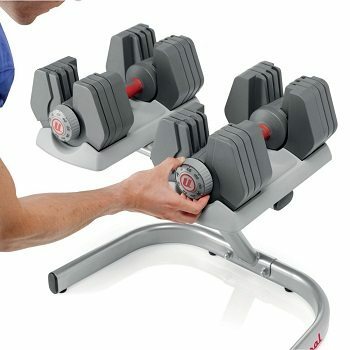 The Universal Power-Pak 445 Adjustable Dumbbells is a set of dumbbells that comes with a stand for easy reachability. Each dumbbell can be adjusted from 4 to 45 pounds, in 5-pound increments, allowing you to switch rapidly from one exercise to the next with a twist of the lock. It does include an ergonomically designed dumbbell stand so you can safely store your dumbbells. The handle is wrapped in thermoplastic rubber for achieving that comfortable non-slip grip. 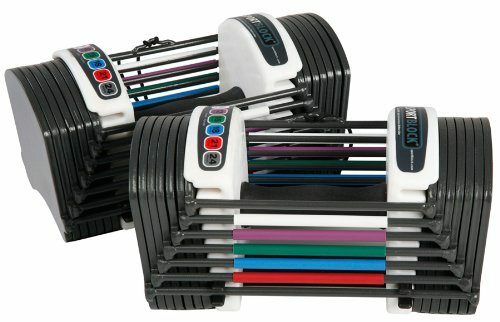 A great space and money saver, the Universal Power-Pak replaces nine sets or 18 individual dumbbells in one neat package. A workout guide is also included for those who are new to weight lifting. 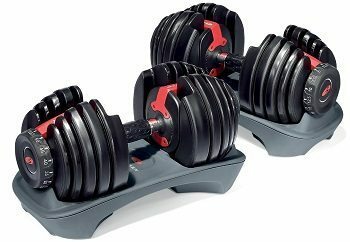 The BowFlex Select Tech 552 Adjustable Dumbbells incorporates the same design from previous dumbbells on the list. Each dumbbell can be adjusted from 5 to 52.5 pounds, adjusts in 2.5-pound increments up to the first 25 lbs. It combines 15 sets of weights into one by using a unique dial system that you can rapidly switch from one exercise routine to the next. Comes with a holding plate to prevent the dumbbells from rolling around the floor and for neat storage. The weight can range from 5 to 52.5 lbs (2.27 to 23.8 kg) for each dumbbell which can enable you to increase your strength gradually without bulking up. Bow Flex offers a 2-year warranty on the weight plates and parts. 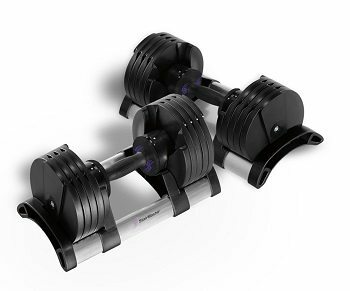 Last but not the least, the Stair Master Pair of Twist Lock Adjustable Dumbbells. These are probably the most expensive on the list at around $500. The simple and highly visible weight selection windows clearly show the selected weight and compact patented design delivers the most compact adjustable dumbbell available. 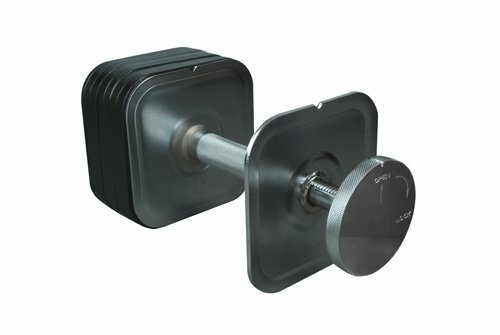 With a weight range starting at just 5 pounds, this gives users of all different fitness levels the freedom to execute a wide variety of exercises at the comfort of their home without having to purchase the same number of regular dumbbells with no knobs to turn, pins to align, or levers to slide. For safety, the weight changes can only be made when the handle is in the cradle and contoured, soft grip handles and aluminum cradle deliver unmatched quality. Considering the price of spending a lot of money for this pair of dumbbells, Stair Master does not include any warranty on the product.